For over a decade, a team including biologists from Colorado Parks and Wildlife, the US Forest Service, and environmental non-profit Rocky Mountain Wild, has studied the movements of wildlife on Interstate 70 near Vail Pass. The team trained citizen scientists, with the help of Walking Mountains Science Center, to aid in the project – changing camera batteries, carrying cameras to the designated sites – all in an effort to answer the question – what wildlife has been crossing or attempting to cross I-70 near Vail Pass? The cameras have caught elk, moose, deer, black bear, coyote – even a lynx – all attempting to cross the highway. As the case for wildlife crossing structures continues to build, the thought crossed Rocky Mountain Wild Executive Director Tehri Parker’s mind – what if you could travel the I-70 corridor with one of these biologists in your car? How would the way you viewed the world outside your windshield shift? Would you be more inclined to remember that your car is traveling through habitat? Enter the Wild I-70 Audio Tour. Created by Rocky Mountain Wild, this free (and hands free!) app uses quirky dialogue to break down science-based facts about a variety of topic related to wildlands. You don’t need a biology degree to understand the audio tour – it is designed to be enjoyed by all ages. The tour showcases segments that run 6-8 minutes in length, stretching from Golden to Glenwood Springs. 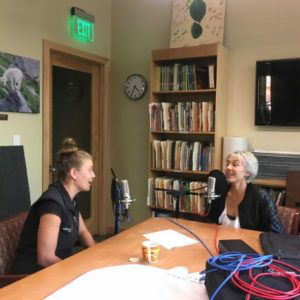 Most segments feature an expert in their respective field – guest voices include aquatic ecologists, game wardens, conservation biologists – speaking to topics that vary from reintroducing the lynx, to the mating behaviors of bighorn sheep, to why animals migrate. The Wild I-70 Audio Tour isn’t all science – one stand-alone segment features a poem by former Aurora poet laureate Jovan Mays about Glenwood Canyon, with references to the ancient people who inhabited the landscape. Each segment features a song donated by a Colorado musician, offering locals and visitors alike the chance to hear local artists. The collaboration extends itself even further into the music and activism realm with narration by Stephen Brackett, rapper in the band The Flobots and founder of non-profit Youth on Record. Erica Prather is a Campaign Assistant at Rocky Mountain Wild, and inhabits two worlds – the arts and the sciences – and these collide in “Artivism” projects such as the Wild I-70 Audio Tour. She also draws upon experiences in her science-based adventures as a naturalist guide in Alaska, a conservation trail team member with Environment Agency of Iceland, and science teacher in Seoul, South Korea – all experiences that involve interpretation. Erica is driven to galvanize Americans to both love and defend their public lands.